The International Code Council (ICC) December 21 released the unofficial voting results on US building code change proposals considered in 2018, including passage of the entire package of 14 tall mass timber code change proposals, clearing the way for their inclusion in the 2021 International Building Code (IBC). 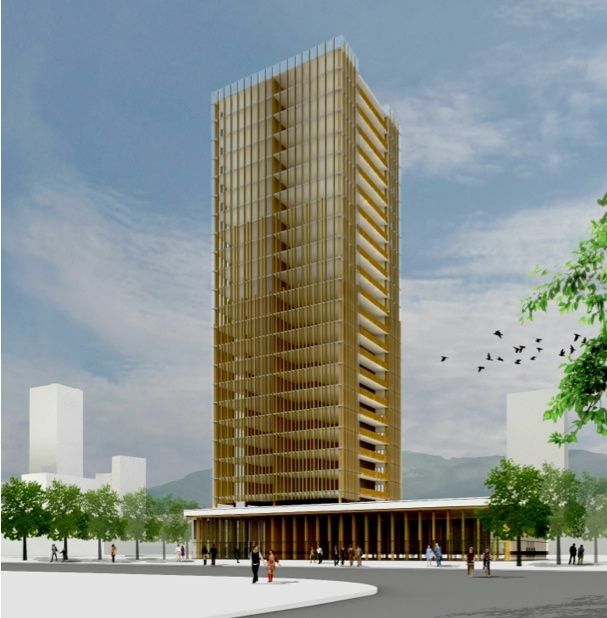 Taken together, the 14 tall mass timber code change proposals create three new types of construction in the United States, setting fire safety requirements and allowable heights, areas, and number of stories for tall mass timber buildings up to 18 stories tall. Mass timber includes any product currently permitted for use in Type IV construction, including cross laminated timber, structural composite lumber, glued laminated timber, and large-section sawn lumber. Canada, Austria, and Germany are the largest providers of construction lumber. The United States, too, is catching on to what Europeans have been using for decades. Unlike the West Coast, whose forestry industry is now facilitating a mass timber boom in states like Washington and Oregon, there are few trained installers on the East Coast. To boost domestic production, the Softwood Lumber Board (SLB), an industry-funded consortium of North American wood manufacturers, now seeks to educate architects, engineers, developers, and general contractors about the advantages of products such as cross-laminated timber (CLT), nail-laminated timber (NLT), and dowel-laminated timber (DLT). While CLT and NLT manufacturing plants are located in Montana and Portland, OR, DLT is only manufactured in the Canadian province of British Columbia. The energy required to produce a laminated wooden beam is one-sixth of that required for a steel one of comparable strength. As trees take carbon out of the atmosphere when growing, wooden buildings contribute to negative emissions by storing the stuff. When a mature tree is cut down, a new one can be planted to replace it, capturing more carbon. After buildings are demolished, old beams and panels are easy to recycle into new structures. And for retrofitting older buildings to be more energy efficient, wood is a good insulator. A softwood window frame provides nearly 400 times as much insulation as a plain steel one of the same thickness and over a thousand times as much as an aluminum equivalent. It is important to note that the construction industry alone is responsible for 50 per cent of the carbon dioxide (CO2) released in the United States. As levels of carbon in the atmosphere rise, the threat of climate change increasingly presents itself as one of the greatest challenges facing this generation. Therefore, it is imperative for developers, architects, and policy makers to reconsider the use of steel and concrete. One single tree can sequester 1 tonne (1 ton) of CO2 in less than 40 years. By comparison, that same tonne of CO2 is released into the atmosphere through the production of 1 tonne of cement. The beauty of mass timber is it can serve as a finish material while providing the required fire-resistance rating. Wood also burns much more predictably than concrete, and the required thickness (generally 19 mm or ¾” for each hour of fire rating) can easily be engineered. 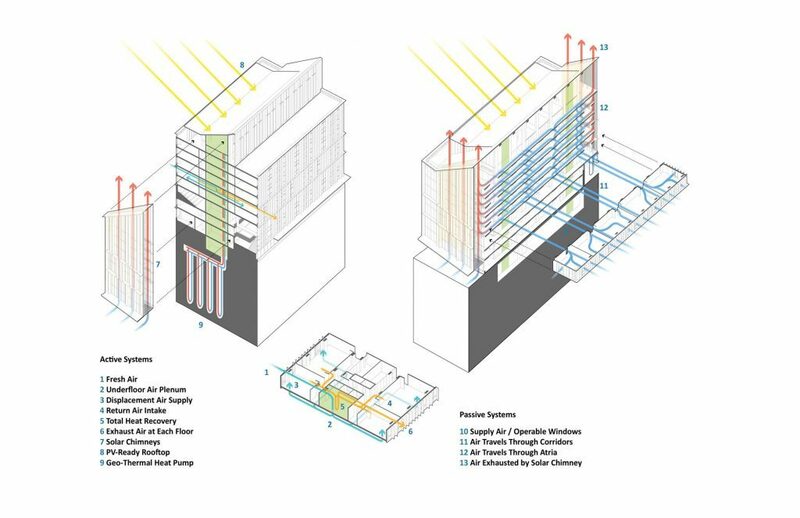 A 30-story residential tower consists of regularly spaced Cross Laminated Timber shear walls, utilizing the redundancy of residential modules. The structural system is therefore, like a wooden version of a concrete ‘flat plate,’ with no beams or dropped panels. 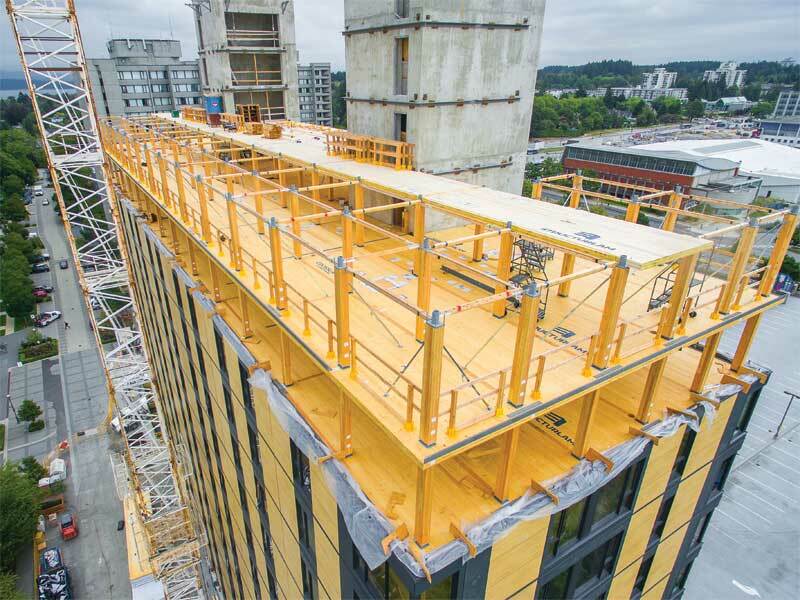 Conversely, the 45- and 60-story office towers are hybrid structures, combining mass timber (CLT slabs, glued-laminated timber [glulam] columns, and cross-bracing) with a steel core and steel connections. The columns reach thicknesses as wide as 1.5 m (5 ft) in the main lobby, gradually tapering to a manageable 0.6 m (2 ft) on the penthouse levels. The X-bracing on the perimeter assists with lateral stability, almost as if Chicago’s Hancock Tower were built using mass timber. Wood structures are much lighter than steel or concrete, and as a result, their foundations can be up to 30 per cent smaller. This lightness becomes an interesting problem for mass timber skyscrapers, and a 76-mm (3-in.) concrete topping slab is necessary on each floor to provide both ballast and acoustic isolation. 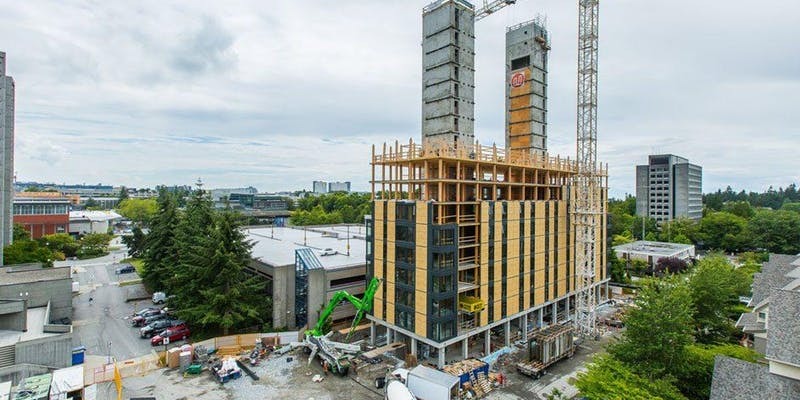 Generally speaking, mass timber projects can be built 20 per cent faster than concrete and steel buildings, and with a smaller construction crew. As a worthwhile exercise, some architects and general contractors/builders in the US worked together to develop an apples-to-apples comparison between mass timber, concrete, and steel. 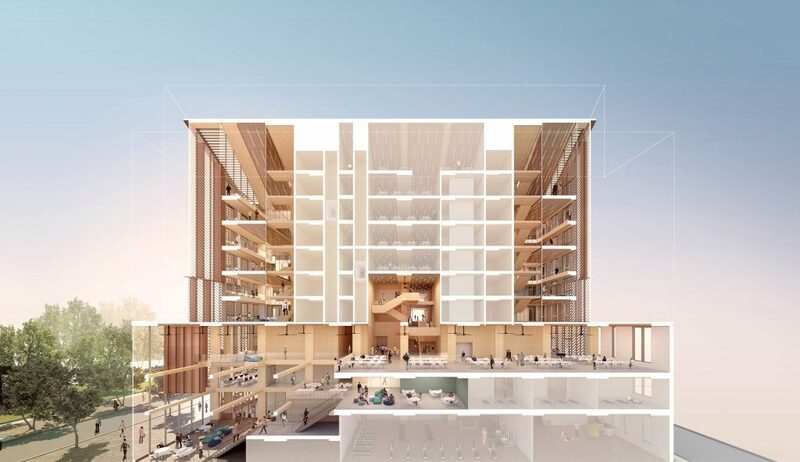 The goal was to understand not only the cost premiums but also the design implications of bringing a code-compliant mass timber building to the D.C. market. Along with several pure wood and composite structure solutions, the pricing exercise concluded mass timber costs roughly US$8 more per square foot than concrete. More than 5 billion tonnes of cement—the raw material for concrete and mortar—is produced globally each year, adding 6% to carbon emissions. The steel industry, half of whose production goes into construction, accounts for another 8%. Under the current regulatory framework, for example, emissions from the cement industry will rise 4% by 2050 if policymakers take no further action, according to a report published last April by the IEA and the Cement Sustainability Initiative. If zero-carbon standards were changed to include the emissions from building and demolishing structures, many of the perverse incentives in the building regulations would disappear. It would probably lead to more building with wood. Many mature forests do little to take extra carbon out of the atmosphere. Chopping some of them down, storing the carbon in wooden buildings, and planting new trees increases forestry’s contribution to removing carbon from the air. Because wood is so light compared with steel, brick or concrete, it lends itself to the mass production of buildings in factories. That should cut emissions from moving materials to building sites. British Columbia is moving particularly quickly. A decade ago the spread of mountain pine beetles left 18 million hectares of dead trees in the province. If those trees were left to rot or to burn in forest fires, Canada’s total carbon emissions would increase by 2% in 2000-20. So Canada passed a law in 2009 that required wood to be used in all new buildings erected with public money. Unlike cement, wood is already a composite material. It is made of cellulose fibres embedded in a matrix of lignin, an organic polymer that serves a number of purposes, including providing woody plants with their rigidity. In May Stora Enso, a Finnish forestry-products company, launched a wood-derived alternative to oil-based plastics. This material, called DuraSense, looks a bit like popcorn. It consists of wood fibres, including lignin, obtained from pulping and other operations. The fibres are mixed with oil-based polymers and other additives, such as colouring agents. The resulting granules can be melted and moulded in the same way as plastic is in factory processes. Adding wood fibres, the company says, can reduce the amount of plastic needed to make goods with plastic parts by 60%. Materials-science researchers in the US are also finding that plant fibres can add durability and strength to substances already used in the construction of buildings and in goods that range from toys and furniture to cars and aircraft. A big bonus is that, because plants lock up carbon in their structure, using their fibres to make things should mean less carbon dioxide is emitted. The production of concrete alone represents some 5% of man-made global CO2 emissions, and making 1kg of plastic from oil produces 6kg of the greenhouse gas. By adding vegetable platelets to the mix, a team of US researchers have made concrete stronger. The group is still exploring exactly how strong it can make concrete by adding platelets, but initial studies suggest that the impact could be considerable. Just 500 grams of platelets can reduce the amount of cement needed to make a cubic metre of concrete by about 40kg—a saving of 10%. The team have now embarked on a two-year study to investigate the process in more detail and to perfect the best mix for use by the construction industry. Stora Enso has also found a use for pure lignin, which is often a waste product of papermaking, since most paper is made of pulp with the lignin removed. Stora Enso’s engineers have worked out how to use lignin as a substitute for the oil-based resins and adhesives employed in the manufacture of engineered timbers, such as plywoods. Nor are they alone in looking for structural applications for lignin. Along with others they are seeking ways to use it to replace oil-based materials in carbon-fibre composites, which are used to make lightweight parts for cars and aircraft. By contrast, Hu Liangbing and Li Teng of the University of Maryland are trying to make a better material by removing, rather than adding, lignin. Their aim is to create a “super wood” that is stronger than most metals. Their approach is to treat blocks of wood with sodium hydroxide and sodium sulphate in a chemical process similar to that used to remove lignin from papermaking pulp. The difference is that they remove only enough lignin to make the wooden blocks easier to compress. They do that by squeezing the treated wood at around 100°C, which causes most of the pores and tubelike fibres within the wood to collapse. This increases its density threefold and its strength elevenfold. That puts super wood on a par with some of the lightweight titanium alloys used in high-strength aerospace components. It is also bulletproof. In one test Dr Hu and Dr Li made a laminated sample by placing five sheets of the stuff on top of one another, each sheet having its fibres aligned at right-angles to those of the sheet below. When shot at, this material splintered but was still able to trap a steel projectile that passed effortlessly through a similarly sized sample of natural wood. That team are now trying to commercialise their process, which they think will be inexpensive to scale up. It works on both hardwoods and softwoods, so a range of materials can be created. The researchers reckon that, one day, houses, cars, furniture and many other things will be made mainly or partly from densified wood. In 2015 world leaders meeting in Paris agreed to move towards zero net greenhouse-gas emissions in the second half of this century. That is a tall order, and the building industry makes it even taller. Cement-making alone produces 6% of the world’s carbon emissions. Steel, half of which goes into buildings, accounts for another 8%. If you factor in all of the energy that goes into lighting, heating and cooling homes and offices, the world’s buildings start to look like a giant environmental problem. Buildings can become greener. They can use more recycled steel and can be prefabricated in off-site factories, greatly reducing lorry journeys. But no other building material has environmental credentials as exciting and overlooked as wood.